The April Julep collection was full of bright colours so I decided to upgrade yet again. Not only did I want the bright cremes, I also wanted try the Grape jelly and the dry shampoo. Here is my unboxing! I've been enjoying this dry shampoo. While I still prefer my powder dry shampoo a touch more, the Julep one is easy to use, sprays on clear, and has a nice formulation. The scent is very light but still seems to keep my hair smelling reasonably fresh. I haven't used this product enough to be able to tell if it makes a difference but I love the packaging and the way the product applies. The applicator is a brush similar to a Stila Lip Glaze and the serum itself goes on very easily. I prefer this product to the Julep cuticle oil because I actually find the cuticle oil a little messy. I love candy so I could really appreciate the little freebie in this month's box. 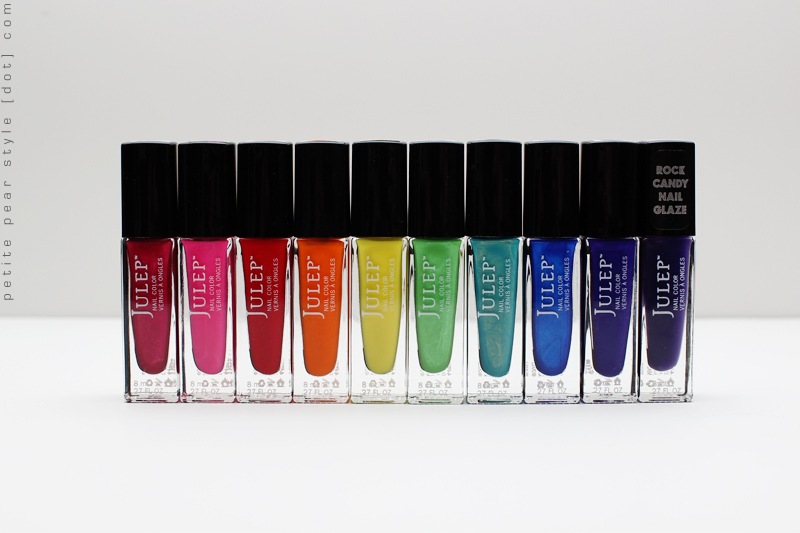 There were 10 nail polishes in the full collection - here is a closer look at the pretty rainbow. I am currently wearing this colour on my toes and it's a really pretty bright raspberry shade. I am wearing this shade in the video and I love it! This is a gorgeous cherry red that is very close to opaque in one coat. It looks like candy and has an extremely shiny, almost jellylike, finish. This shade is also very pigmented and is a beautiful deep purple. Due to the neon pigments, it does apply a little on the matte side but I used this shade with the jelly polish (#10 below) and it looked amazing. This shade is very sheer on its own but it provides a beautifully shiny jelly finish when applied on top of a purple nail polish. I also want to try a jelly sandwich with this polish one day! I am really loving this collection for the summer and can't wait to try the electric blue shade next. I am happy to have added Avery and Jackie to my collection - those are probably my favourite shades in this collection (no surprise since I am partial to red, pink, and creme polishes). Julep is $19.99 including shipping but you can preview months and skip as many boxes as you want. There is a promotion going on right now where you can type in FREEBOX to get your first box at no charge. I believe you only have to pay shipping of $3.99. If you are interested in signing up to Julep and don't mind using my referral link, I would earn points and send heaps of good karma your way! FTC: I used my referral credits in exchange for the April Julep box. Love the shades :) The cuticle serum really does have nice packaging! thanks!! you wear bright colours so well... i keep thinking about the essie resort collection you picked up!! I am so happy I upgraded too! The colours are fantastic!